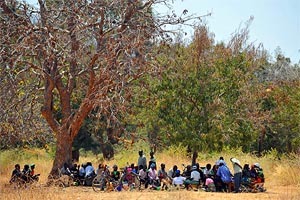 The Forest Law n° 08.022, 17 October 2008, is, until present, the principle instrument for forest policy implementation in the Central African Republic. This Forest Code includes a number of measures aimed at the efficient use of forest resources balanced with the protection and conservation needs of natural resources and improvement of forest governance. At the same time, the CAR still does not have any policy orientation document constituting a comprehensive framework for the forest sector development. The objective of the Technical Cooperation Programme (TCP) project TCP/CAF/3402 is to support the government of CAR in the elaboration of national forest policy. The project will follow a participatory approach involving all the concerned stakeholders in the negotiation and definition of forest policy objectives and strategic lines. It will contribute to a better governance and sustainable management of forest resources. A forest policy orientation document is expected at the end of the project.